C1 Home-Use Water Purifier | Products | NGK INSULATORS, LTD. This water purifier uses fine ceramics filters to provide consumers with safe, delicious water in the home. As a leading manufacturer of ceramics, NGK is active across a wide range of fields. Offering outstanding heat and corrosion resistance and durability, our proprietary fine ceramics filters are used in settings ranging from the production processes for beer, wine, and mineral water to water purification facilities used to produce potable water. Taking advantage of ceramics technologies accumulated over many years across this broad range of applications, we've developed the C1 Home-Use Water Purifier, a countertop device that lets consumers enjoy safe, delicious water in the home. Fine ceramics filters featuring a uniform distribution of countless ultrafine submicron-level pores reliably filter out microbes and microorganisms while blocking substances like particulates and rust from water pipes. It's a next-generation water purifier from dependable water professionals. Uses high-performance activated charcoal filters that slash concentrations of harmful trihalomethane and lead. Delivers water flows of 3.5 L/minute for polishing rice, rinsing vegetables, and other uses. Cartridges indicate recommended replacement times on an LCD display based on measured use. NGK collects and recycles the used cartridges free of charge. 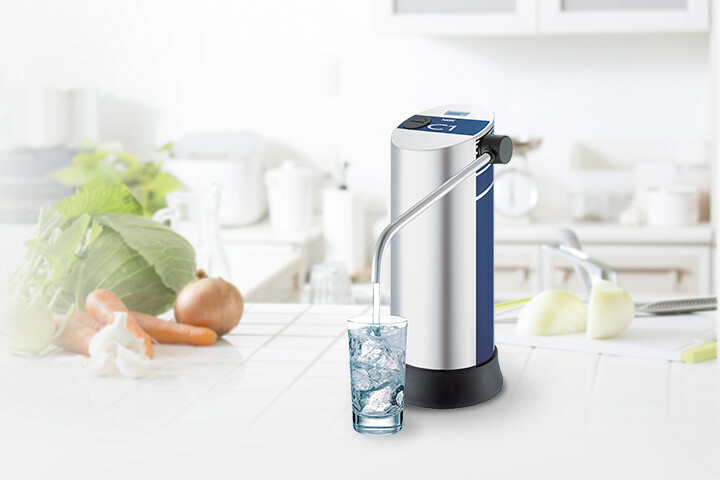 C1 Home-Use Water Purifier Our line of products include standard countertop products; premium products that offer, in a world-first, a feature that produced lightly carbonated water; and compact wall-mounted products that can be installed on kitchen walls to save space.